Three Chicago police officers accused of falsifying police reports as part of a conspiracy to cover up the 2014 police shooting of 17-year-old Laquan McDonald were found not guilty on all counts Thursday. 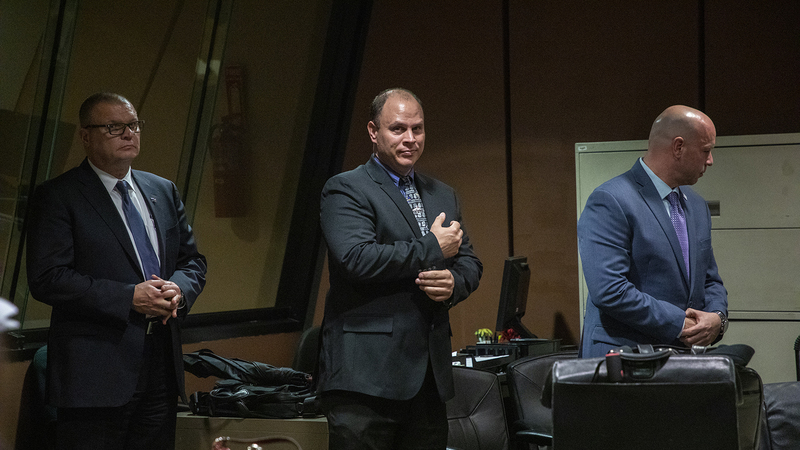 The defendants, former detective David March, ex-officer Joseph Walsh and officer Thomas Gaffney, had been charged with official misconduct, obstruction of justice and conspiracy. In her hourlong ruling, Associate Justice Domenica Stephenson hammered away at the prosecutors’ evidence, including police reports recounting the moments leading up to former Officer Jason Van Dyke’s shooting of McDonald. Stephenson said prosecutors had no way of knowing whether Van Dyke and March thought an attack was or was not imminent when they left their vehicle and approached McDonald, who was armed with a three-inch knife. The ruling comes at a crucial point for police reform as Chicago prepares to pursue a consent decree, a federal court order directing reform of the city’s police department – and as the city prepares to vote for a new mayor in February. Several candidates in that crowded race have announced their intention to replace Police Superintendent Eddie Johnson. The verdict also comes on the eve of a scheduled sentencing hearing Friday for Van Dyke, who was found guilty of second-degree murder and 16 counts of aggravated battery with a firearm in October. What impact – if any – will Thursday’s verdict have on reforming a so-called code of silence within the police department and improving the relationship between police officers and the communities they serve? Joining us to give their insights are Sharon Fairley, the former chief administrator of the Independent Police Review Authority and Civilian Office of Police Accountability; University of Chicago clinical law professor Craig Futterman; criminal defense attorney Gal Pissetzky; and retired Chicago Police Sgt. Peter Koconis.